Helpful for everyone with a head, neck and jaw. 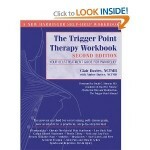 Trigger point therapy is one of the most intriguing and fastest-growing bodywork styles in the world. Medical doctors, chiropractors, physical therapists, and massage therapists are all beginning to use this technique to relieve formerly undiagnosable muscle and joint pain—conditions that studies have shown to be the cause of nearly 25 percent of all doctor visits. The technique involves applying short, repeated massage strokes to trigger points, tiny contraction knots in muscle tissue where restricted circulation and lack of oxygen cause referred pain. Trigger points create pain throughout the body in predictable patterns characteristic to each muscle, producing discomfort ranging from mild to severe. Trigger point massage increases circulation and oxygenation in the area and often produces instant relief. •homemade energy drinks that work and taste like Red Bull, minus the sugar and the price tag. Translating complex food science into easy-to-understand advice, Chace thoroughly explains the scientific basis for each medicinally active ingredient so you know you’re getting the most out of your daily shake. 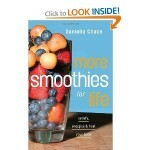 Your blender will never be put to better use! Consequently, people who suffer from chronic fatigue, chronic pain, and many other miseries often endure not only the ailment but dismissive and negative reactions from others. 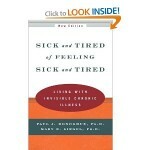 Since its first publication, Sick and Tired of Feeling Sick and Tired has offered hope and coping strategies to thousands of people who suffer from ICI. Paul Donoghue and Mary Siegel teach their readers how to rethink how they themselves view their illness and how to communicate with loved ones and doctors in a way that meets their needs. The authors’ understanding makes readers feel they have been heard for the first time. For this edition, the authors include a new introduction drawing on the experiences of the many people who have responded to the book and to their lectures and television appearances. They expand the definition of ICI to include other ailments such as depression, addiction, and obsessive-compulsive disorders. They bring the resource material, including Web sites, up to the present, and they offer fresh insights on four topics that often emerge: guilt, how ICI affects the family, meaningfulness, and defining acceptance. This is a personal narrative, a record of my passage among victims of chronic pain and the discoveries that have come from those encounters. I write for physicians, nurses, therapists, and caregivers, but mostly, I write for you who suffer the disease. I know you very well, perhaps as well as anybody in the world. I have listened to your stories with patience and attention, and I have been greatly rewarded. You have trusted me with the deep recesses of your thoughts and fears, and the memories of the dreadful experiences that are so often the origin of chronic pain. I have treated thousands of you and I believe I have some understanding of your illness. 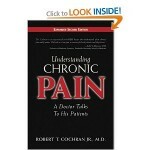 I offer a series of essays about people like you who suffer chronic pain. From their case histories, I derive certain conclusions. Some conclusions are bold and imaginative. Some are disturbing and frightful. Not all of them will apply to you, but some certainly will. My wish is that you gain greater understanding of you. 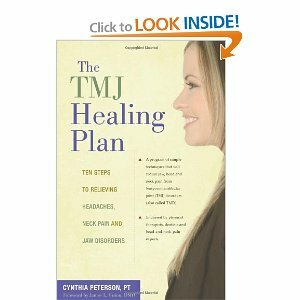 The HEALTHMINDER Personal Wellness Journal has been published for the past 16 years under the title MEMORYMINDER Personal Health Journal. 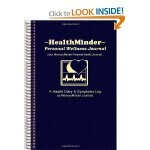 HealthMinder is simply a new, more descriptive title for this excellent, checklist-style health diary. For conditions or concerns of virtually any kind, the HealthMinder is an easy way to keep track of everything including medications, vitamins, vital signs, pain and other symptoms, sleep habits, daily exercise, meals, and much more. Even the weather and pollen counts can be logged. As part of the easy-to-use daily format, two human body outlines make it simple to mark areas of pain, rashes, etc. Each day consists of a 2-page spread and the spiral binding makes it convenient for writing. Records will be more organized and accurate; patterns may be discovered, progress can be observed. The pages are not pre-dated so it can be used every day or whenever needed. Doctors, patients, health enthusiasts, caregivers, students, and others rave about the HealthMinder. This journal can, indeed, be a lifesaver! 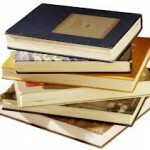 Do you have any books to add to our list?